Well, it was bound to drop at some point. Take a look at our favorite Jedi’s new getup. The attire is reminiscent of the Jedi Masters of the prequels, as well as his previous mentor, Obi-Wan Kenobi. 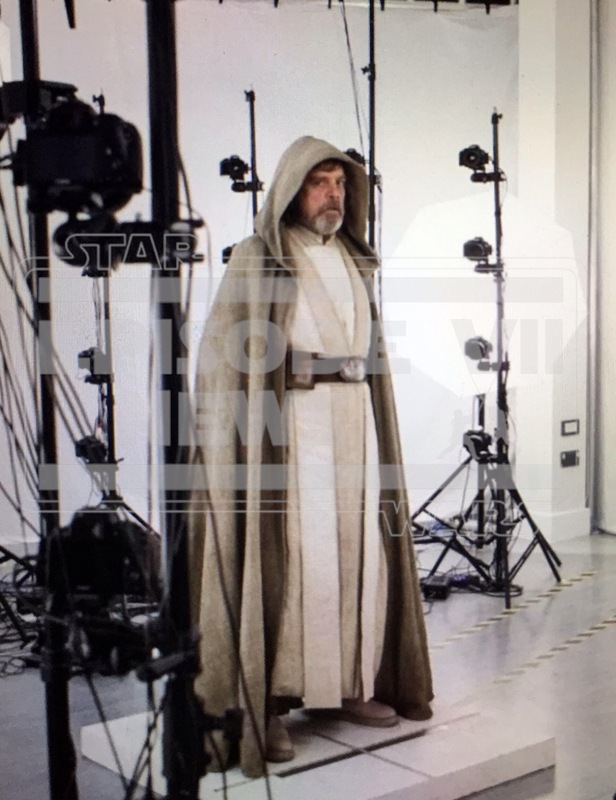 The way he’s standing, along with the surrounding camera equipment and lighting appears to be some sort of full body scan – probably for an action figure. What do you think? Well. The first movie I remember seeing was Empire Strikes Back. It was my first real love. My dad bought me a few figures, told me about the force, and had me sit through it. I ate it up. Your daughter may really enjoy it. For an intended sequel, this representation of Luke might work very well. I look forward to seeing the movie, and I hope it won’t let me down like the prequels did. So far it seems they’re on the right track. Like it! But then, I’m married to a chap with a greying beard. On a more serious note, holding my enthusiasm a bit in check for the time being. Isn’t Disney producing this? I feel a bit like someone who learns that their favourite childhood sweet – not seen in the shops for many years – is going to be manufactured again … by a fast food chain. I see what you’re saying. Disney is producing it. But I believe it’s in good hands. It’s not Disney making it. It’s Lucasfilm and their Story Group. It’s become apparent that they’re listening to fan wisdom, and what we’ve seen has only been superb. Disney also owns Marvel Studios, Pixar, and the distribution rights of to Studio Ghibli. They’ve done right on all accounts. Pixar is the most critically acclaimed animation studio in the states. Marvel hasn’t had a flop (critically or financially) after 12 films. I think Disney knows what they’re doing with this one. Cheers! I knew Pixar has a good reputation, and I can’t imagine Disney wanting it to be a flop.